COLOGNE, Germany — German officials are scrambling to make sense of the latest twist in the brewing war over U.S. steel and aluminum tariffs, which could see Washington dole out exemptions based on allies’ defense-spending levels. The idea of coupling the two issues first came up last week, when U.S. Treasury Secretary Steve Mnuchin told CNBC that President Donald Trump would factor military contributions to NATO into the application of a 25 percent tax on imported steel and 10 percent on aluminum. European officials have largely rejected the move as a serious threat to transatlantic relations. European Budget and Human Resources Commissioner Günther Oettinger argued in a Sunday interview with Germany’s ARD television station that the talks to resolve the dispute should exclude defense spending. “This should be only about trade. Defense, NATO or other topics should not get mixed up,” he said. Trump has repeatedly criticized what he views as underspending by European countries on the continent’s security. While Germans may not see eye to eye with the U.S. president, officials with Germany’s incoming governing coalition plan to increase the budget to take greater responsibility in defense. Berlin spends upward of €37 billion (U.S. $46 billion) on the military per year. That amount clocks in at less than 1.2 percent of gross domestic product — an allocation below the NATO-wide target of 2 percent by 2025. The Bundeswehr, or German armed forces, already has seen spending hikes in recent years, but the country’s economic output has risen at such a tempo that the percentage of defense spending has not discernibly moved upward, analysts say. Growth plans for the upcoming three budget years include annual increases of €4 billion, €5 billion and €6 billion, respectively, bringing the percentage of GDP to roughly 1.5 percent, according to officials. That amount, they add, is about the maximum extra that the Bundeswehr can sensibly spend at this point, given the military’s size, administrative capabilities and acquisition regulations. Pounding Germany’s defense-spending habits in the context of steel and aluminum tariffs “sends exactly the wrong signal,” said Christian Mölling, deputy director of the German Council on Foreign Relations’ research institute. While there is currently a majority in favor of spending increases, the added stress of a transatlantic trade war runs the risk of emboldening anti-Trump voices who oppose them, Mölling argued. “It's not a sensible way of having this discussion,” he said. 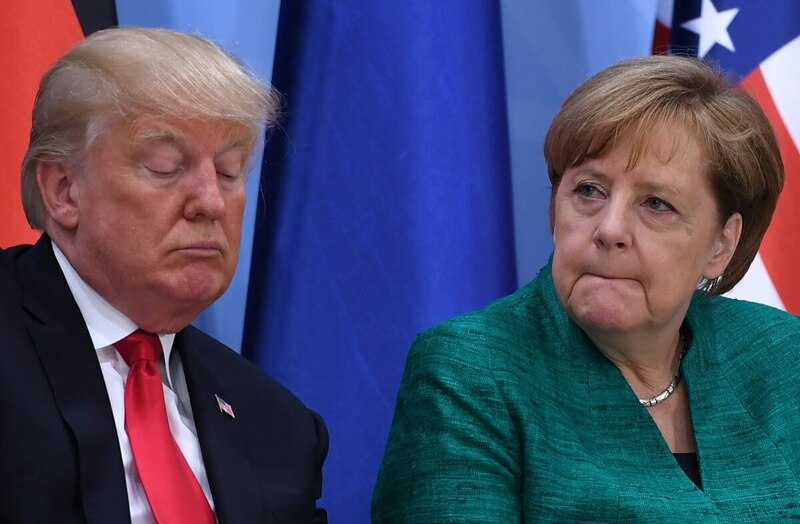 The apparent attempt to specifically target Germany suggests Trump may not understand that Berlin has ceded trade authority to Brussels, giving the whole European Union bloc a unified voice in the tariff debate, he added. The U.S. Treasury Department could not be immediately reached for comment on the administration’s understanding of European trade authorities. In the end, he said, Trump’s argument undermines NATO’s fundamental reason to exist, which is coming to a member’s aid without any preconditions whatsoever. Berlin’s “dilemma” of wanting to increase defense spending but being unable to do it quickly enough for the 2 percent target will continue to be a thorn in the side of German Chancellor Angela Merkel’s dealings with Washington, Kamp predicted. But as it has before, the U.S. president’s scorn may simply turn back away from Germany, at least for a while. “The attention span is short. These things change,” Kamp said.